Product Developers create and develop a huge range of industrial and commercial products. 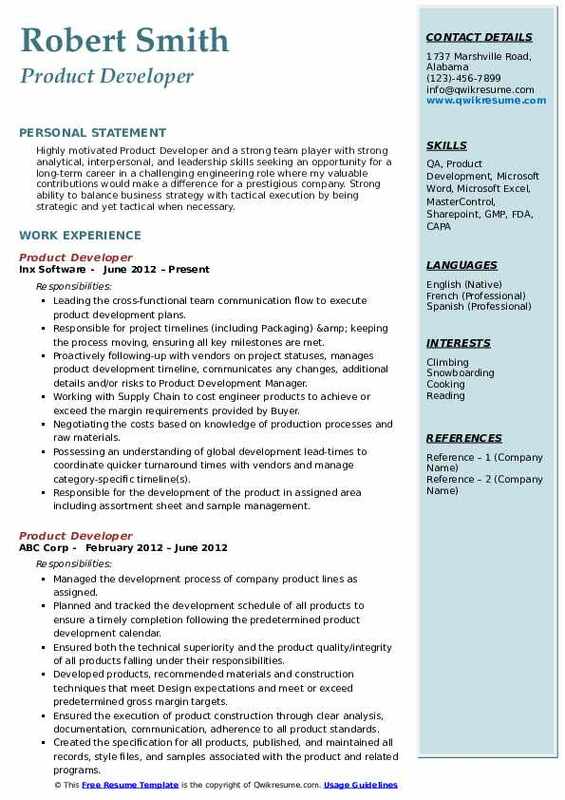 Product Developer Resume normally emphasizes of job duties such as managing and coordinating with clients and internal staffs for project completion, analyzing the market trends and making a thorough research, creating and tracking competitive products, consulting with engineers, communicating directly with clients to gain vision of the wants, creating rough specifications and lastly working along with marketing professionals for successful launch of products. Candidates interested in this line of operation have to highlight in the portfolio a Bachelor’s degree in engineering, design or the related with skills such as designing knowledge, creativity, customer service orientation, the ability to create prototypes, adequate product knowledge, competent computer knowledge and proficiency in AutoCAD. 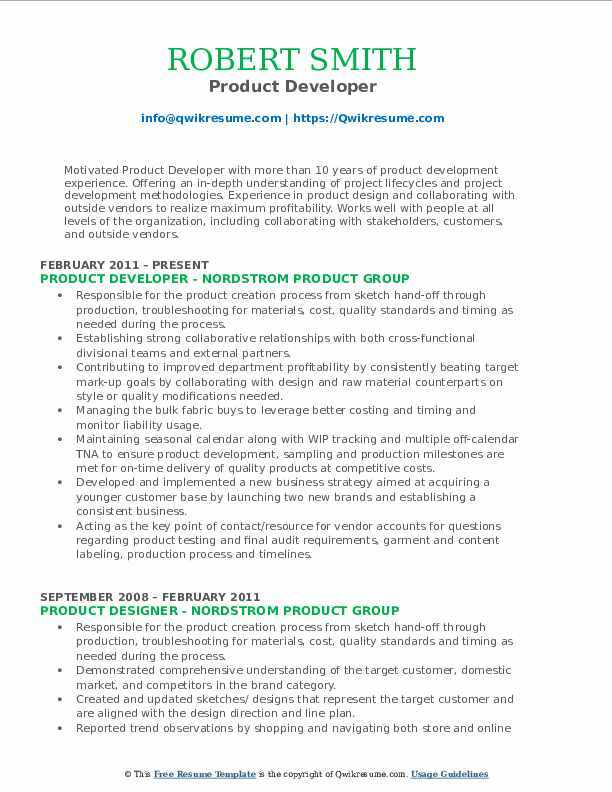 Summary : Inspired Product Developer I with 14 years of experience in merchandising, buying, and product development. Proven track record of forging productive and innovative relationships with collogues, domestic vendors and overseas partners. Proactive problem-solver with exceptional time-management and organization skills, and in-depth costing experience. Developed products to design specifications while maximizing margins and profitability. Delivered 150+ styles per season at or above target margins. Sourced styles based on factories capabilities and performance history to ensure high quality and efficient production and delivery. Sourced materials and trims to assure quality, price and minimum quantities met or exceeded established rip curl standards. Created seasonal design and development timelines and actions along with the merchant to plan sourcing meetings, design tech packs, technical development and sales meeting. Negotiated pricing, minimums and lead-time with vendors to maintain margin requirements. Improved performance of technical categories by establishing higher standards for fabric quality and construction and improving or maintaining pricing requirements. Developed all fabric, lab dips, artwork, yarn-dyed wovens, solids and printed fabrics for walk shorts and denim, and samples from prototypes to top of production to ensure compliance with rip curl standards for design, quality, functionality, and margin and on-time delivery of salesmen samples and production. 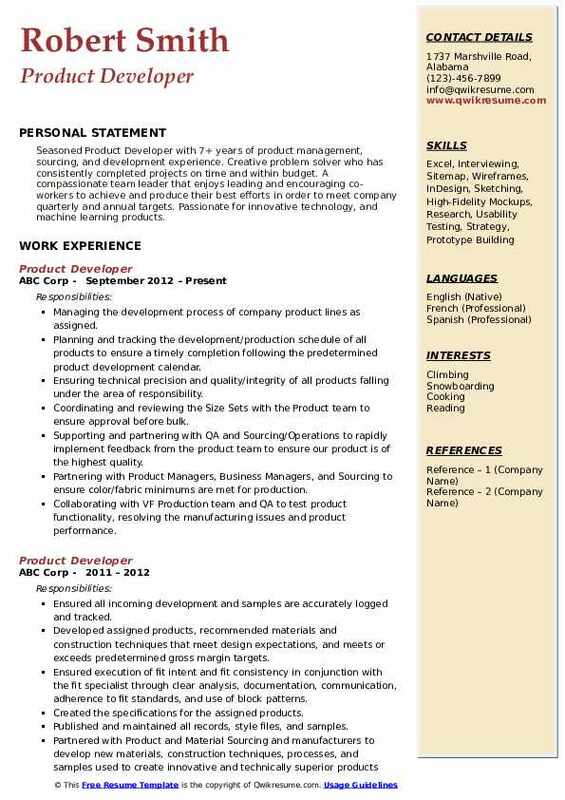 Headline : A talented and skilled Product Developer with an extensive five plus years of experience in the specialty retail market, encompassing product development, production, visual merchandising, and sales. Superiors and peers have always regarded me as an equitable individual, who is a highly creative thinker, problem solver, and a valuable team player. As a person who thrives to challenge myself, I openly welcome new opportunities that will broaden my knowledge and those around me. Partnered with the director of development and the president; taking lead in creative meetings with artists, strategically planning assortments for soft lines, hardlines, or other creative services. Negotiated with multiple global vendors developing designs and product lines that were unique, price competitive, and tailored to the client's brands to drive sales and maximize profits. Conducted bi-weekly meetings for a customer base of 8-12 clients to maintain successful relationships. Reviewed line lists, creative packages, and inquiring about needs/wants to continually grow the business. Traveled to trade shows, client venues, vendor offices, and shopped the competitive markets to identify new and future opportunities. Collaborated with the Margaritaville home office as a liaison between the brand team and the franchise groups to identify that the execution of all deliverables adhered to brand standards. Scheduled all tasks for the artists and participated in weekly meetings providing rough sketches with focused reference materials as needed, resulting in fewer revisions. Summary : Accomplished Product Developer III experienced in designing, developing, and maintaining Property and Casualty insurance solutions. Self-motivated with strong work ethics and a commitment to producing quality solutions. Proven ability to work with new technologies and platforms. Responsible for researching and resolving defects entered into an issue tracking system. Experienced in conducting in-depth requirements analysis of end users business needs and transform them into solid solutions. Participated in work effort estimates and project schedule breakdowns. Performed peer review, created adequate test cases, prepared system, and performance test. Planned, and executed the regression, system, and performance testing to ensure high-quality. Created and maintained technical user guides, release document, installation guide, and hardware and software requirements document. Trained and mentored junior programmers in product knowledge and programming best. Performed technology upgrades to the latest version of a third-party software, windows. Implemented and maintained multiple environments using subversion for version control and. 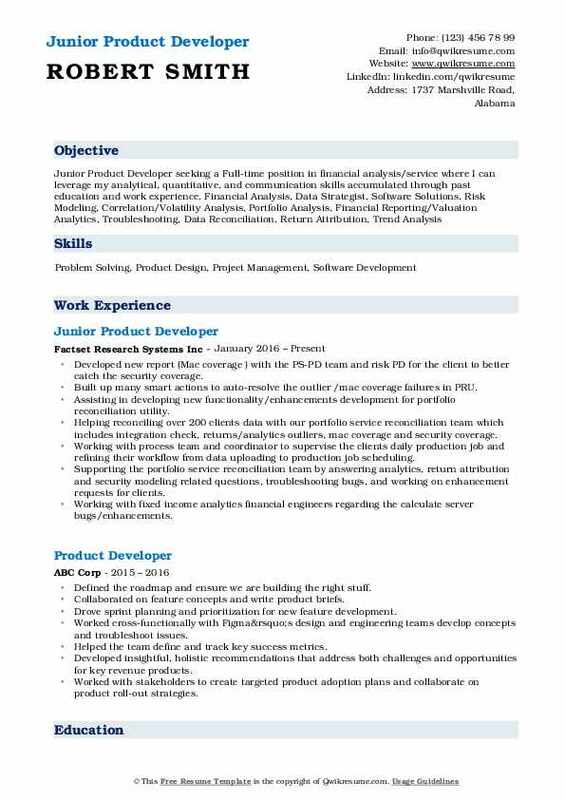 Summary : Self-driven, dynamic Senior Product Developer with over 7 years of diverse experience. Demonstrate the ability to produce and lead exceptional performance within a team environment, creatively resolve problems, and capitalize on opportunities. 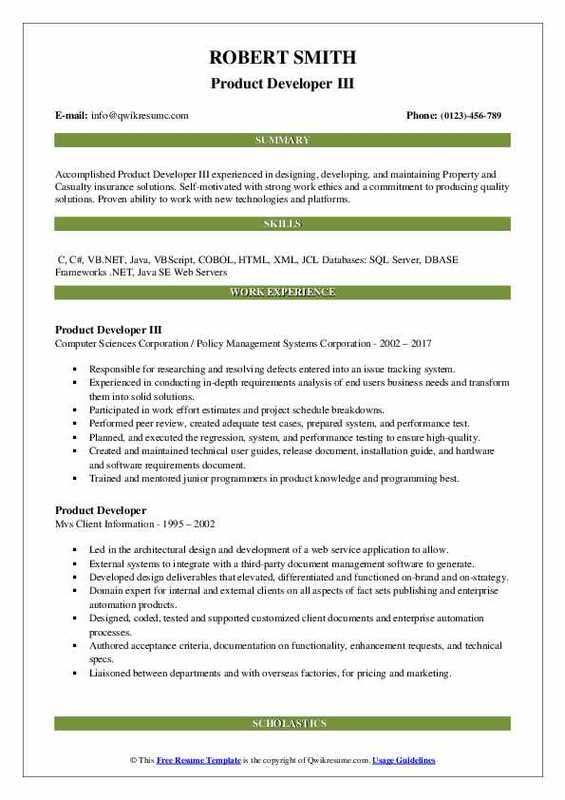 Experienced in applying the Agile methodology, managing projects through complete project lifecycle and supporting product development. Creating sample purchase orders/ordering new samples for customers/sales reps. Using QuickBooks software for PO, sales orders, invoices, pack slip invoices. Managed online store/photograph and edit pictures of samples add/update new content to the website, created line sheets, created catalogs using InDesign and PhotoShop. Managing projects, creating successful concepts, and direction for clients, conducted efficient marketing strategies. Researching, screening, and strategically combining various resources and partnerships to improve cost-benefits. Successfully led key projects/production which resulted in overall success and increased ticket purchase. Creating treatment and scripts, press releases, flyers for event promotion. Keeping an inventory of backdrops, projectors, computers, and other display materials. Negotiating and securing the event space/planned out layout of seating and decorations. 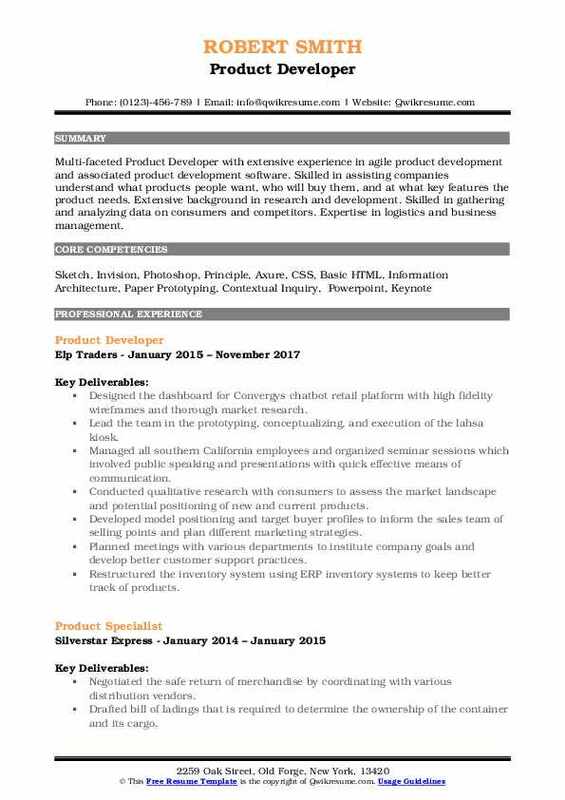 Headline : Highly motivated Product Developer and a strong team player with strong analytical, interpersonal, and leadership skills seeking an opportunity for a long-term career in a challenging engineering role where my valuable contributions would make a difference for a prestigious company. Strong ability to balance business strategy with tactical execution by being strategic and yet tactical when necessary. Leading the cross-functional team communication flow to execute product development plans. Responsible for project timelines (including Packaging) & keeping the process moving, ensuring all key milestones are met. Proactively following-up with vendors on project statuses, manages product development timeline, communicates any changes, additional details and/or risks to Product Development Manager. Working with Supply Chain to cost engineer products to achieve or exceed the margin requirements provided by Buyer. Negotiating the costs based on knowledge of production processes and raw materials. Possessing an understanding of global development lead-times to coordinate quicker turnaround times with vendors and manage category-specific timeline(s). Responsible for the development of the product in assigned area including assortment sheet and sample management. Coordinating & creating materials for various meetings, from team concept brainstorming to cross-functional presentations. Developed new report (Mac coverage ) with the PS-PD team and risk PD for the client to better catch the security coverage. Built up many smart actions to auto-resolve the outlier /mac coverage failures in PRU. Assisting in developing new functionality/enhancements development for portfolio reconciliation utility. Helping reconciling over 200 clients data with our portfolio service reconciliation team which includes integration check, returns/analytics outliers, mac coverage and security coverage. Working with process team and coordinator to supervise the clients daily production job and refining their workflow from data uploading to production job scheduling. Supporting the portfolio service reconciliation team by answering analytics, return attribution and security modeling related questions, troubleshooting bugs, and working on enhancement requests for clients. Working with fixed income analytics financial engineers regarding the calculate server bugs/enhancements. Working with the content team to correct and update the security information including the terms and condition. 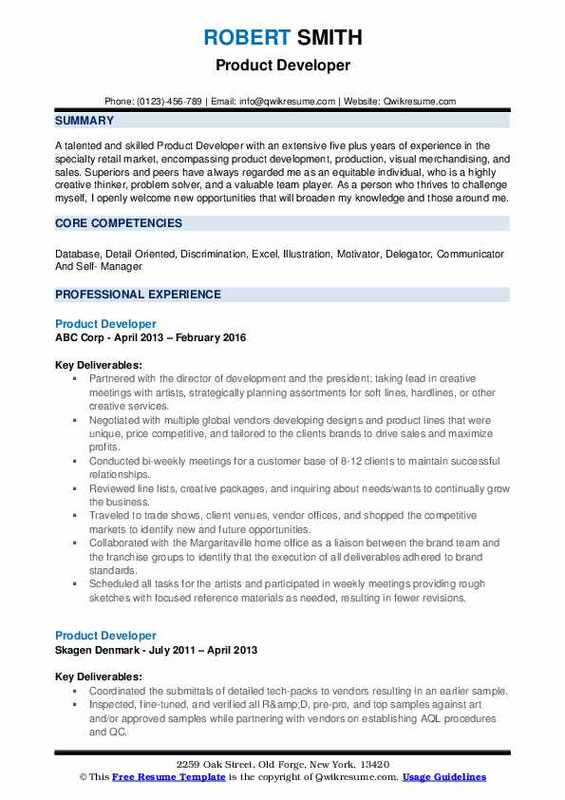 Summary : Motivated Product Developer with more than 10 years of product development experience. Offering an in-depth understanding of project lifecycles and project development methodologies. Experience in product design and collaborating with outside vendors to realize maximum profitability. Works well with people at all levels of the organization, including collaborating with stakeholders, customers, and outside vendors. Responsible for the product creation process from sketch hand-off through production, troubleshooting for materials, cost, quality standards and timing as needed during the process. Establishing strong collaborative relationships with both cross-functional divisional teams and external partners. Contributing to improved department profitability by consistently beating target mark-up goals by collaborating with design and raw material counterparts on style or quality modifications needed. Managing the bulk fabric buys to leverage better costing and timing and monitor liability usage. Maintaining seasonal calendar along with WIP tracking and multiple off-calendar TNA to ensure product development, sampling and production milestones are met for on-time delivery of quality products at competitive costs. Developed and implemented a new business strategy aimed at acquiring a younger customer base by launching two new brands and establishing a consistent business. Acting as the key point of contact/resource for vendor accounts for questions regarding product testing and final audit requirements, garment and content labeling, production process and timelines. 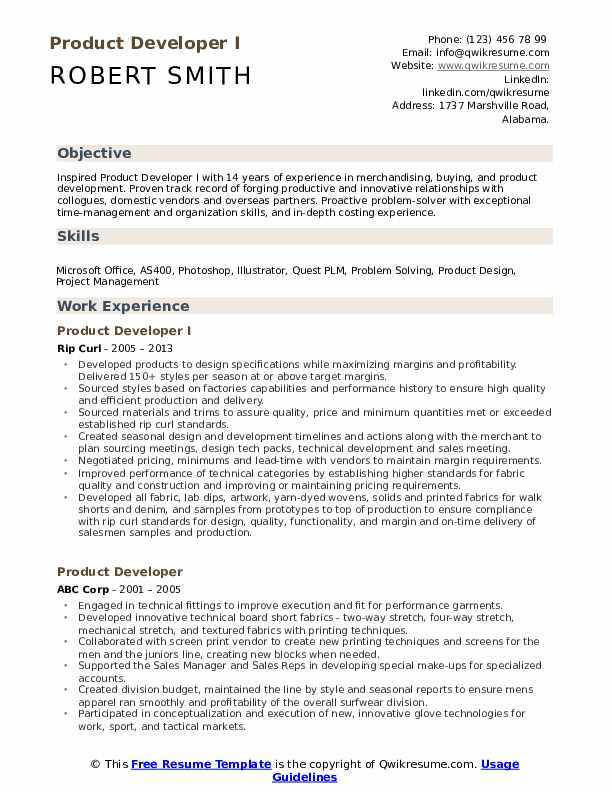 Objective : Multi-faceted Product Developer with extensive experience in agile product development and associated product development software. Skilled in assisting companies understand what products people want, who will buy them, and at what key features the product needs. Extensive background in research and development. Skilled in gathering and analyzing data on consumers and competitors. Expertise in logistics and business management. Designed the dashboard for Convergys chatbot retail platform with high fidelity wireframes and thorough market research. Lead the team in the prototyping, conceptualizing, and execution of the lahsa kiosk. Managed all southern California employees and organized seminar sessions which involved public speaking and presentations with quick effective means of communication. Conducted qualitative research with consumers to assess the market landscape and potential positioning of new and current products. Developed model positioning and target buyer profiles to inform the sales team of selling points and plan different marketing strategies. Planned meetings with various departments to institute company goals and develop better customer support practices. Restructured the inventory system using ERP inventory systems to keep better track of products. Coordinated sales agent activities including designing customized distribution strategies, strategic marketing analysis and planning, and distribution goals. Identified brand identity and key objectives and communicated them to consumers. 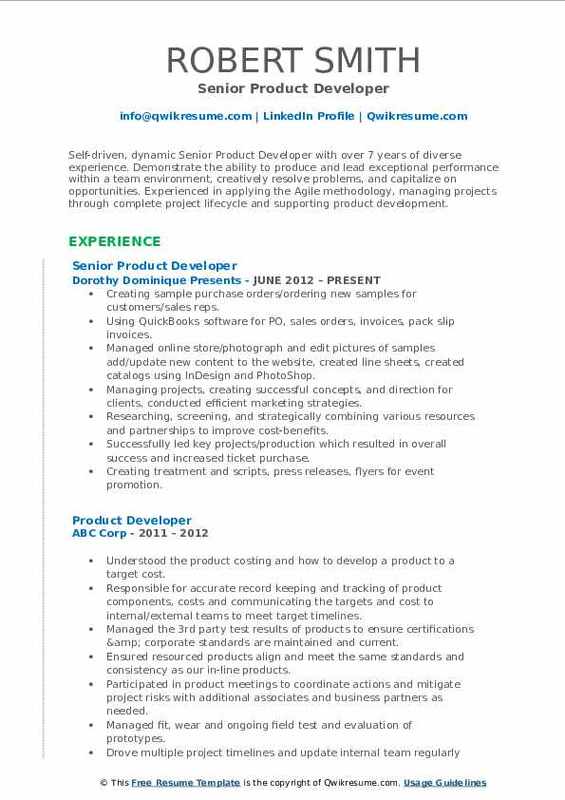 Summary : Seasoned Product Developer with 7+ years of product management, sourcing, and development experience. Creative problem solver who has consistently completed projects on time and within budget. A compassionate team leader that enjoys leading and encouraging co-workers to achieve and produce their best efforts in order to meet company quarterly and annual targets. Passionate for innovative technology, and machine learning products. Managing the development process of company product lines as assigned. Planning and tracking the development/production schedule of all products to ensure a timely completion following the predetermined product development calendar. Ensuring technical precision and quality/integrity of all products falling under the area of responsibility. Coordinating and reviewing the Size Sets with the Product team to ensure approval before bulk. Supporting and partnering with QA and Sourcing/Operations to rapidly implement feedback from the product team to ensure our product is of the highest quality. Partnering with Product Managers, Business Managers, and Sourcing to ensure color/fabric minimums are met for production. Collaborating with VF Production team and QA to test product functionality, resolving the manufacturing issues and product performance. 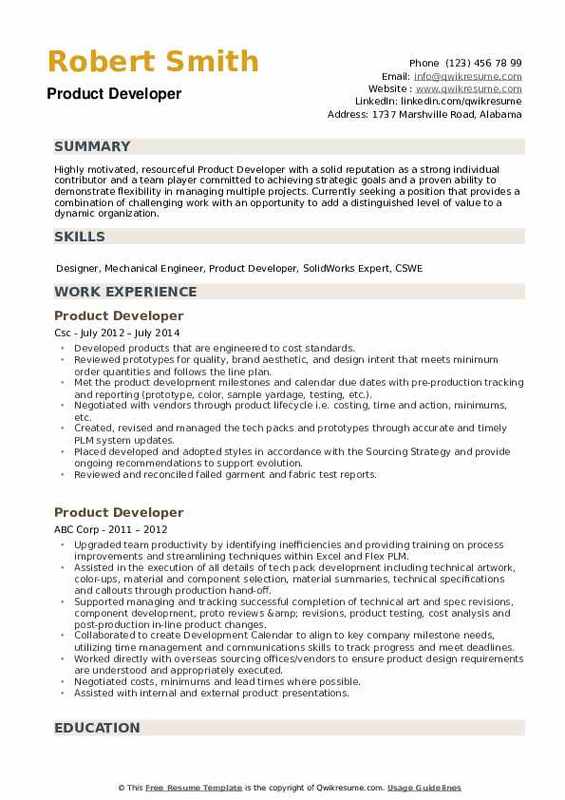 Objective : Highly motivated, resourceful Product Developer with a solid reputation as a strong individual contributor and a team player committed to achieving strategic goals and a proven ability to demonstrate flexibility in managing multiple projects. Currently seeking a position that provides a combination of challenging work with an opportunity to add a distinguished level of value to a dynamic organization. Developed products that are engineered to cost standards. Reviewed prototypes for quality, brand aesthetic, and design intent that meets minimum order quantities and follows the line plan. Met the product development milestones and calendar due dates with pre-production tracking and reporting (prototype, color, sample yardage, testing, etc.). Negotiated with vendors through product lifecycle i.e. costing, time and action, minimums, etc. Created, revised and managed the tech packs and prototypes through accurate and timely PLM system updates. Placed developed and adopted styles in accordance with the Sourcing Strategy and provide ongoing recommendations to support evolution. Reviewed and reconciled failed garment and fabric test reports. Chosen as a subject matter expert to provide insight and feedback necessary for developing an upgraded version of flex PLM, launching a vendor portal program and developing new training curriculum around these improvements.